When journalist Susannah Meadows noticed her three-year-old son, Shepherd, shying away from soccer practice, she had no idea it was the first sign of juvenile idiopathic arthritis. The diagnosis was the first step of a long journey, physically painful for Shepherd and emotionally wrenching for Susannah and her family. But they pressed on, and using a combination of traditional and complementary medicine they beat the disease, and the odds. Meadows includes new information about traditional and nontraditional medicine and the latest science on how the health of our gut bacteria is connected to wellness—and how the right foods play a key role in helping this microscopic population thrive. She also talks with scientists who study the traits and circumstances that may make some people keep going when others feel helpless. These researchers are illuminating the psychology of healing—how the mind, and asserting control over your body and health, can play a part in recovery. 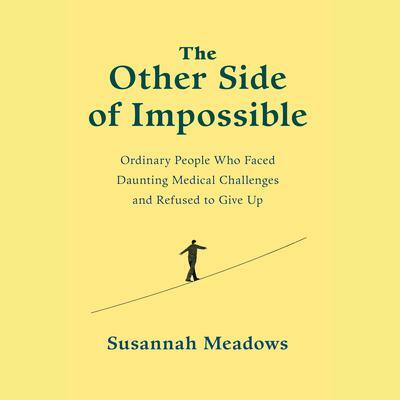 Fascinating, moving, and profoundly inspiring, The Other Side of Impossible gives us people driven by love, desperation, and astonishing resolve—a community of the defiant who share an extraordinary talent for hope and for fighting the battle for healing in today’s world and tomorrow’s.